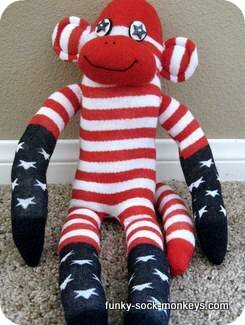 Learn how to make sock monkey dolls. 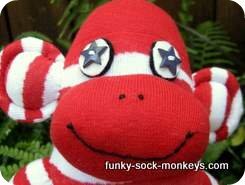 Making a sockmonkey is fun and easy by following the basic sock monkey directions. 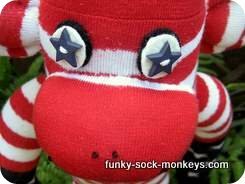 Craft plain old socks into cute soft stuffed sock monkey toys. Step one: You will need American Flag socks. Depending on your countries flag, you can change the directions accordingly. I used the American flag socks as I am residing in USA at this moment in time. 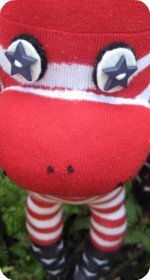 I need to find some New Zealand flag socks to make a sock animal from (New Zealand is my homeland). 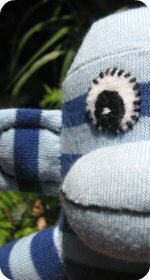 Follow the sock monkeys basic pattern and then for the Eyes: Cut two circular shapes of felt in navy or black and two slightly smaller ones in white felt. 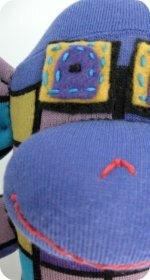 Place navy star buttons on top of the felt circles and stitch to head with white embroidery thread. With black embroidery thread stitch two french knots for the nose and stitch on a big happy smile. Ears: Cut very round ears, sew, stuff and embroider about 1/4 inch in from the outer edge. 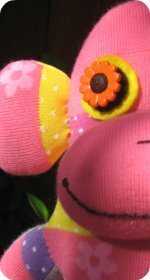 When I sewed around the monkeys hands and toes I shaped them so they were quite pointy and rounded. I was just trying it out to see what it would look like. 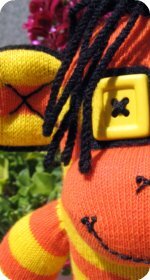 Quite frankly I prefer sewing the ends of the legs and arms pretty much square, as when they are stuffed they look rounded anyway. These socks are actually quite thin, they came out fine but I do prefer thicker socks, as they are much more sturdy for making soft toys. TIP: At the end of the day it doesn't matter how good your stitching is if the sock is super thin. The sock will rip before the stitches ever do. 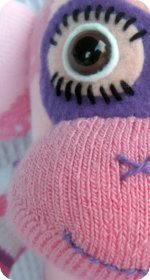 So thicker, sturdy socks are the ones to get if your sock animals are going to be loved for years by little hands.